The Samsung Galaxy Note 8.0 leaked out a few days ago and it didn’t take long for Samsung’s JK Shin to officially confirm it. Now, that we are sure we’d see it at MWC at the end of the month, pictures have started showing up and this latest set shows a different aspect of the Note 8.0 - its S Pen stylus and a side-by-side comparison with the Samsung Galaxy Note II. Samsung has invested heavily into the Note series, setting devices from the lineup apart with their deep support for S Pen with tons of apps and additional functionality like the Air View feature for hover actions for example. father and son :D copy of each other. Wendy. I really love you lol! They should've opted for the same design with the Note 10. The GS3 and Note2 design has watered down to low-end Sammy phones. This only made the Galaxy Note 8 look cheap. No thanks. And seriously, another Samsung tablet? UGLY AS HELL! Oh come on samsung, you can do better than this! GNote 10.1 didn't have a front button,why put one on Gnote 8! It's a fake. Why would a tablet have an ear speaker when it can't make calls? Also, Samsung never puts physical buttons in front of the screen. It's just a giant S3 mockup. US variants of those with carrier logos didn't come with ear pieces. Do your research, or don't post please. 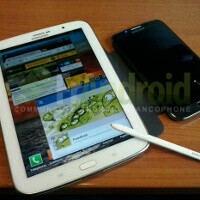 it's not s3.. it's g note2..
Sammy making their tablets look like their smartphones. Hmmmmmmm... Now where have I seen that before? And that's exactly why people are calling them "phablets" and not "smarlphones"
That's taking it a bit out of context, because the iPod Touch is a completely different category from the iPhone (MP3 and media device vs smartphone), where as the Note line is just a big Galaxy S with additional software + a stylus, whereas the iPod Touch is an iPhone minus a few specs and a cellular radio (which makes things a phone in the first place). So the Galaxy S and Note lines are more closely related than the iPhone and iPod Touch lines. Then there's the fact that the Note II being a phone is an officially advertised and fully functional feature, and an iPod Touch making calls is kinda weird and only works on Wifi, all while not being supported by Apple directly. If you compare the Note II to the Nexus 7, they are WORLDS apart in terms of size. That's like saying there's not a big difference between the iPhone 4S and the Droid DNA, it's wrong. I will admit, 6 inches is too big to be commercially used as a phone (without a separate accessory), but Samsung did a relatively good job at keeping the Note II pocket friendly and manageable, and the sales show; 5.5" with minimal bezel is still manageable to a significant part of the market. looks like the hyundai tablet that launched two days before ! I hope sgn8.0 will have the similar speakers like his big brother sgn 10.1. As a owner of this most productive tablet I would like to tell that it has very good speakers. They are in front panel. Because of that the music virtually penetrates the space. The best software features but with this ugly design...I cannot buy it. Nexus 7 still the best for its price,specs,latest updates and the fluidity of the launcher.